When the Syrian protests erupted in March 2011, most Palestinian refugees initially remained on the sidelines, although a small number joined the protests against President Bashar Assad. As the regime began to use heavy violence against protesters and shelled cities, the popular uprising escalated into armed resistance against the Syrian regime. With battles taking place in the outskirts of Damascus, many Syrian residents from the shelled neighbourhoods sought refuge in the Yarmouk refugee camp, which first remained a relative safe haven away from the violence. 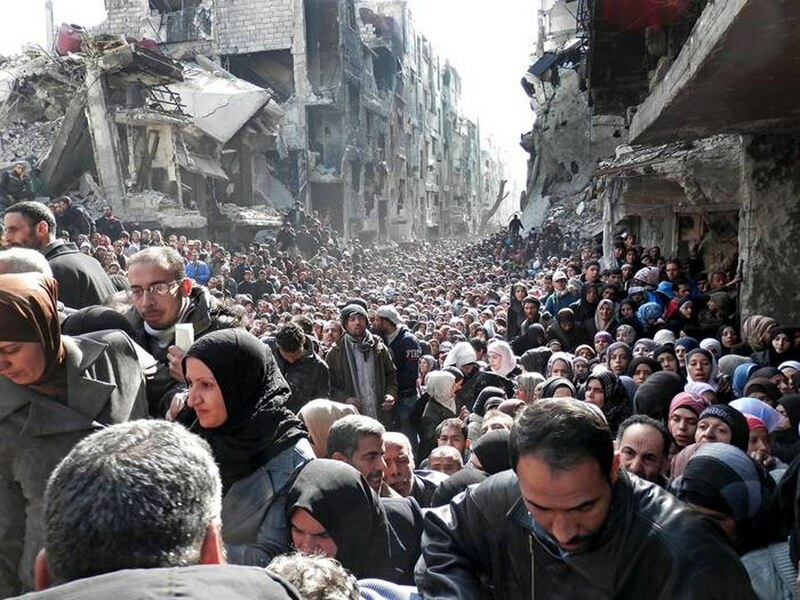 Since mid-2013, the UNRWA and other UN agencies and international organizations have expressed their concerns about the impact of the armed conflict in Syria on the Palestinian refugees residing in the country, especially Yarmouk camp in Damascus, which hosted at least 130,000 before the outbreak of the conflict in Syria and is thought to be the largest community of Palestinians refugees in Syria. Now, fewer than 20,000 refugees remain in the desolate camp (UNRWA, May 2014). At the beginning of the Syrian uprising, in 2011, tensions arose in Yarmouk between pro- and anti-Assad Palestinian residents. Beginning in August 2012, the tensions deteriorated into clashes between the main parties of the conflict in Syria. 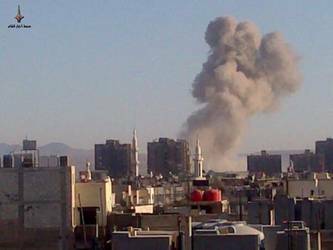 More than 21 civilian refugees were reported killed in August, when the Syrian Army shelled Yarmouk. In December 2012, fierce fighting took place in Yarmouk, involving Syrian army jets, which bombed the camp for the first time. Activists reported that a school and mosque sheltering refugees were hit and that at least 23 were killed, all civilians. On 17 December, rebel forces gained full control of Yarmouk and of another Palestinian camp, with help from anti-Assad Palestinians, pushing out the pro-government Palestinian fighters. On 20 December, the Free Syrian Army said it had forced all pro-government fighters out of Yarmouk and handed it back to the Palestinians. Shortly thereafter, government and rebel representatives agreed that all armed groups should withdraw from Yarmouk and leave it a neutral zone, but a spokesman for the pro-rebel Palestine Refugee Camp Network said that “the implementation of the truce has been problematic” because of “intermittent” government shelling of Yarmouk and clashes on its outskirts. Forces loyal to al-Assad succeeded in controlling access to the camp in February 2013. 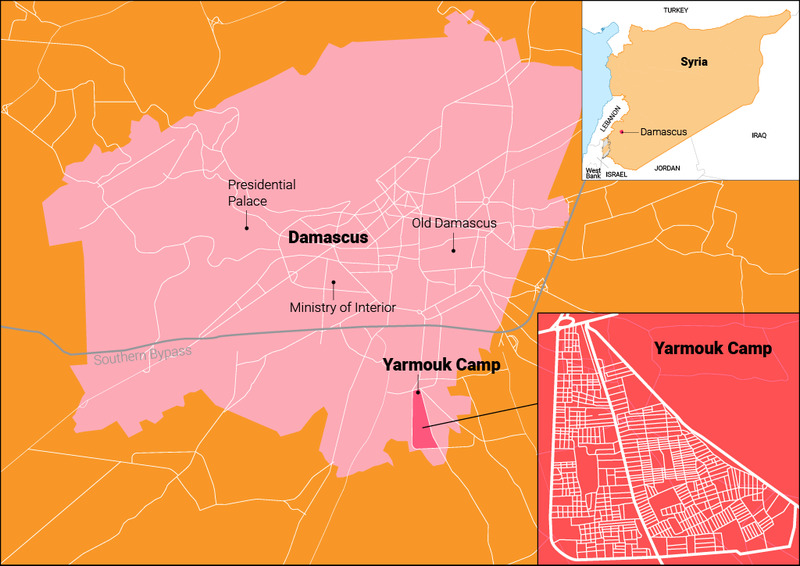 Military checkpoints opened to allow aid to enter and residents to escape, but in July 2013, government forces began blocking access, and Yarmouk has since been under siege. As the blockade has drawn on, the humanitarian situation in the camp has become increasingly dire. According to a UNRWA statement, remaining residents do not have access to adequate food or medical treatment, and there are cases of women dying in childbirth. More than 140 civilians died from starvation, according to an April 2014 statement by the Workforce for Palestinians in Syria group. On 13 January 2014, an UNRWA convoy carrying food for six thousand people—along with ten thousand doses of polio vaccine and other medical supplies—was forced to turn back when it came under fire while trying to enter the camp. One week later, about 138 food parcels had been delivered to the camp, and five hundred food parcels were allowed to enter in early April 2014. Up to January 2014, food aid had not been delivered to the camp since September 2013. The governments of Jordan, Lebanon, Egypt and Turkey are refusing to grant Palestinian refugees from Syria the refugee status, stripping them of their right to protection and aid from the UNHCR. This despite the fact that in September 2002, UNHCR reinterpreted Article 1D of the 1951 Convention relating to the Status of Refugees. Previously the article excluded Palestinians in light of the fact that they were receiving assistance from UNRWA. UNHCR now emphasized the second paragraph, which clarifies that Palestinian refugees are ipso facto refugees and are to be protected by UNHCR if assistance or protection from another UN body terminated. This means that Palestinians should fall under the UNHCR protection mandate. Palestinian-Syrian families seeking asylum in neighbouring Jordan have been turned away at the border, as Palestinian-Syrian refugees carry a ‘Syrian Travel Document for Palestinian Refugees’ and thus lack Syrian citizenship. On 27 October 2012, Jordanian Prime Minister Abdullah al-Nsour issued a statement in the Arabic-language daily al-Hayat that ‘Jordan has made a clear and explicit sovereign decision to not allow the crossing to Jordan by our Palestinian brothers who hold Syrian documents’. According to UNRWA, the number of Palestinian-Syrian refugees who had fled to Jordan reached 4,569 individuals by March 2013. In Jordan, theZaatari camp has stopped accepting those without Syrian identification, and Palestinians are directed to Cyber City, where they are detained until approved for asylum status. The facility is worn-down and its occupants forbidden from stepping outside its walls for any length of time. Palestinian-Syrians in Lebanon are likewise not eligible for assistance from UNHCR. 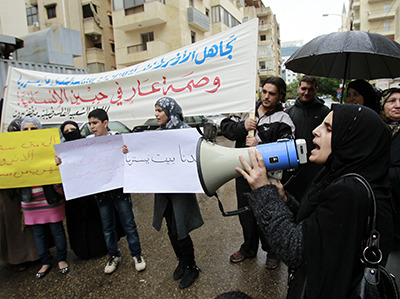 UNRWA states that approximately 32,000 refugees were in Lebanon by March 2013. In a country already home to 400,000 Palestinian refugees, Lebanon is not ready or willing to accommodate more Palestinians, and has therefore denied them the right to set up new camps on Lebanese soil, complicating the challenge to immediately shelter the displaced. UNRWA is trying to provide families with cash and access to medical and education services, yet these are meager resources as aid agencies are strapped for cash. Former President Mohammed Morsi of Egypt issued a decree in September 2012 granting exceptional rights to Syrian refugees in Egypt, including the right to protection, residency permits and access to government schools. UNHCR and partners opened their doors to the Syrians in Egypt and expanded their outreach efforts and level of assistance. But the presidential decree did not include Palestinian-Syrians refugees. At Cairo airport, some families were allowed entry on short-term tourist visas. Many young men between the ages of 18 and 40 were however sent straight back to Damascus to face the mistrust of the Syrian authorities towards asylum seekers rejected by Egypt. In Egypt, by March 2013, deportations and arrests of Palestinian-Syrians started to become more regular. By the end of March 2013, their number was estimated at 11,000 or approximately 1,900 families, arriving from the Yarmouk refugee camp and other camps in Syria. Palestinians in Egypt are not assisted by UNRWA and lack formal UNHCR protection. As a signatory of the Universal Declaration of Human Rights and several other covenants on civil and political rights, Egypt has the obligation to ensure basic rights to Palestinian refugees.